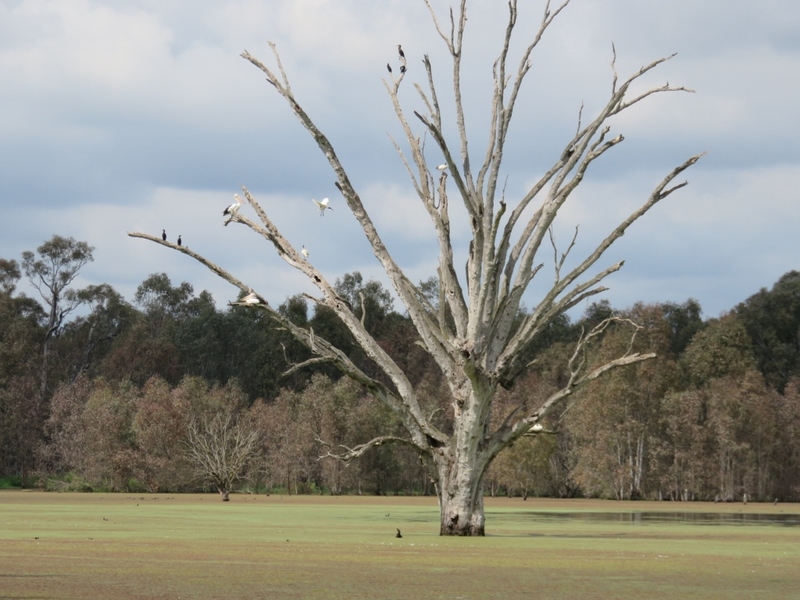 The name Wonga means Cormorant in the local indigenous Wiradjuri language. 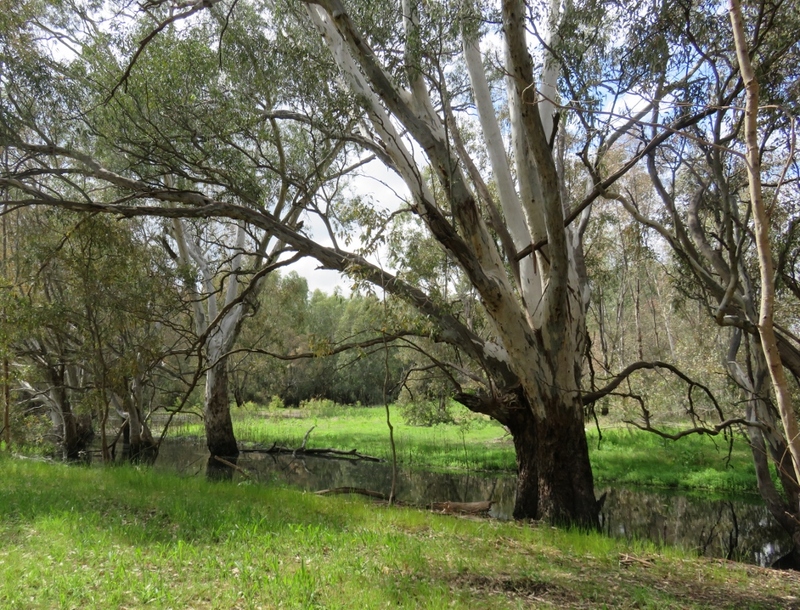 These wetlands cover around 80 hectares on the Murray River floodplains, near the city of Albury. 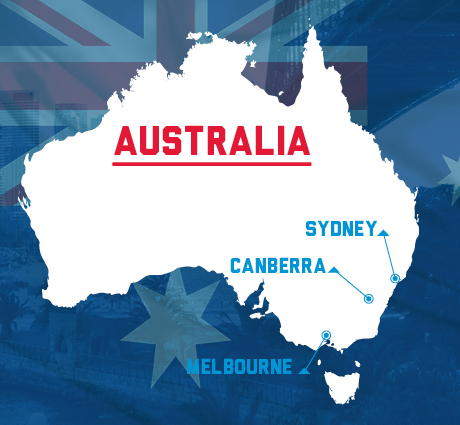 I have included a map showing Canberra in relation to Sydney and Melbourne, the two biggest cities in Australia. 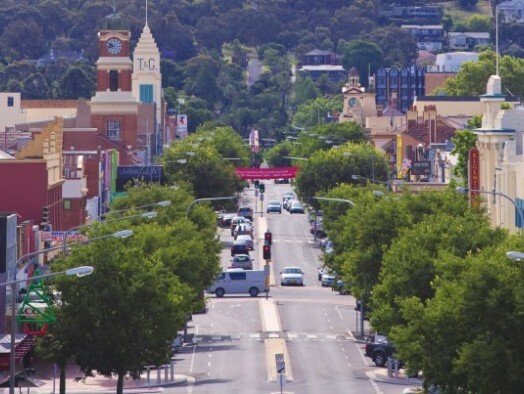 Albury is about midpoint between Canberra and Melbourne. 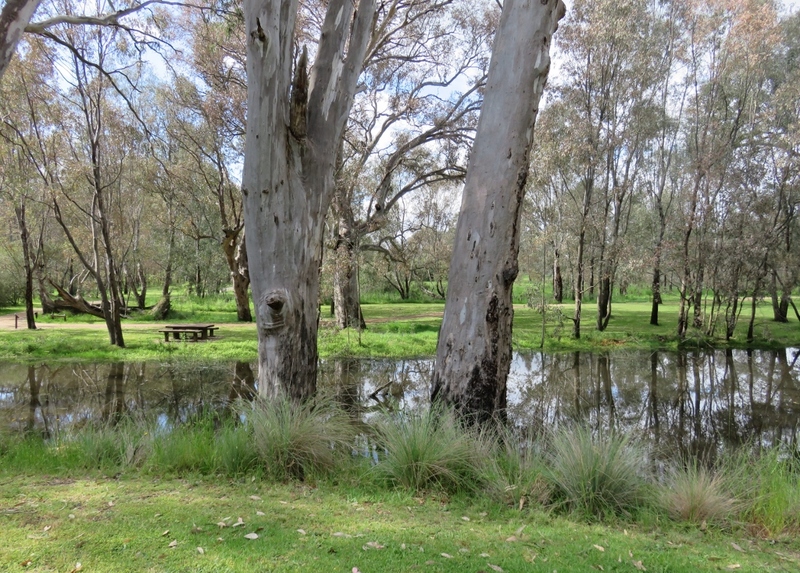 We stopped off in Albury on our way down to Melbourne to visit our little granddaughter, and the Wonga Wetlands are on the outskirts of the town. 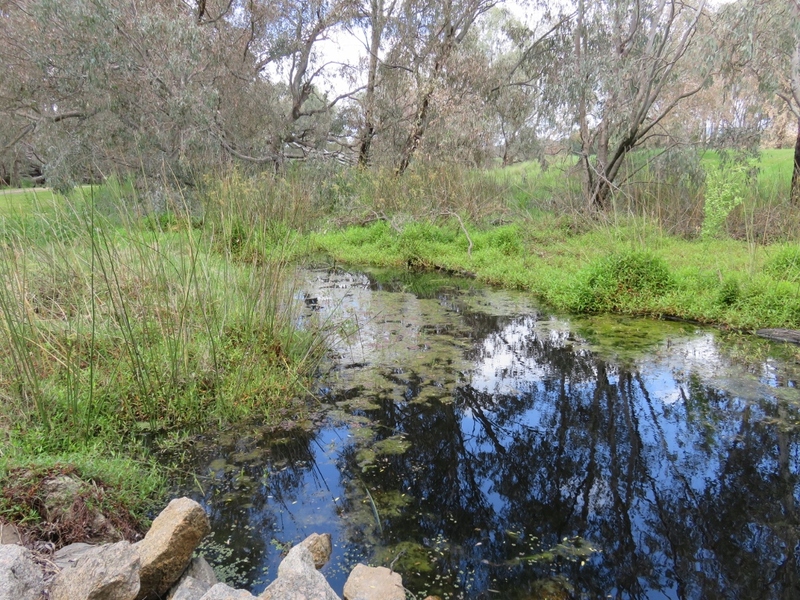 These lagoons are being gently restored after many years of farming and grazing using reclaimed water from the Murray River. It is an area that is now being developed to conserve and protect the habitat, and the native flora and fauna. 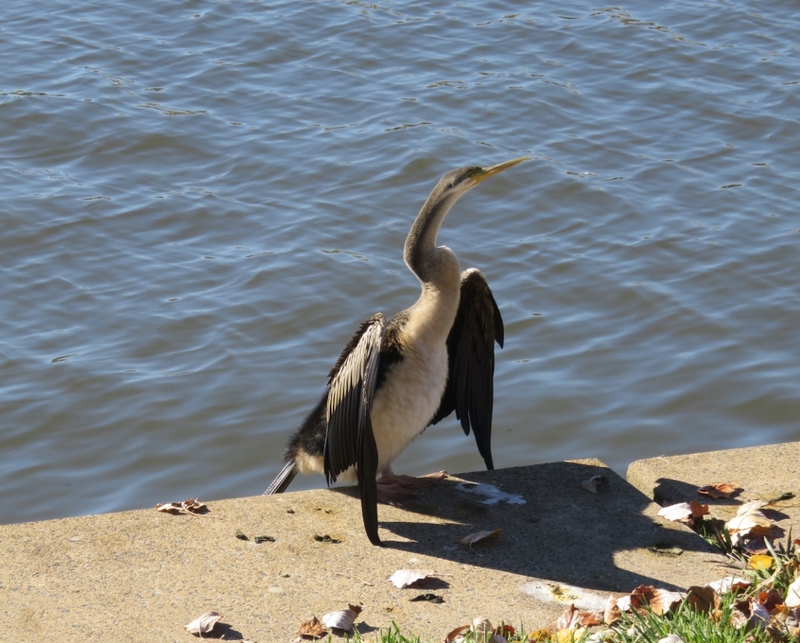 It wasn’t that easy to photograph birds on the move in this wetland environment, so I have added a photo here of a Cormorant taken along the bank of Lake Burley Griffin …to show this fine bird at close range. 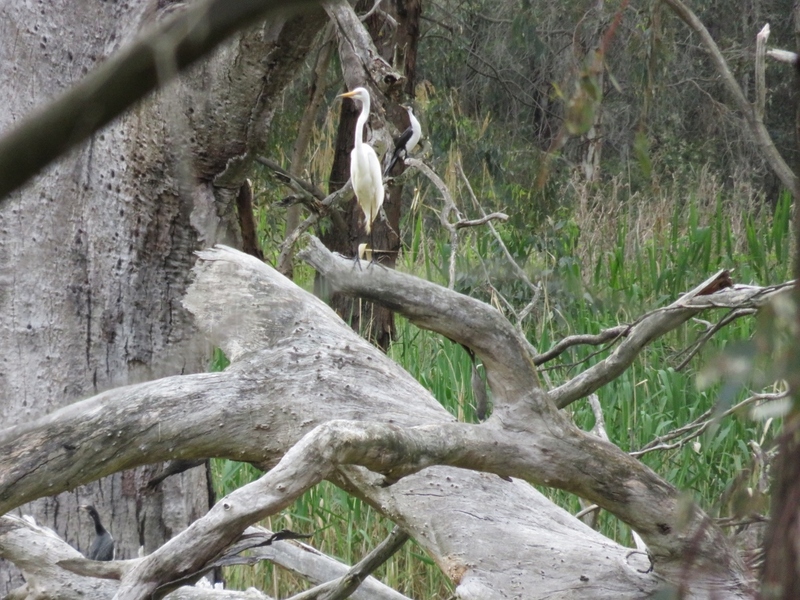 The photo below shows an elegant Egret and behind the Egret is a Cormorant, much smaller than the one from Lake Burley Griffin in Canberra. 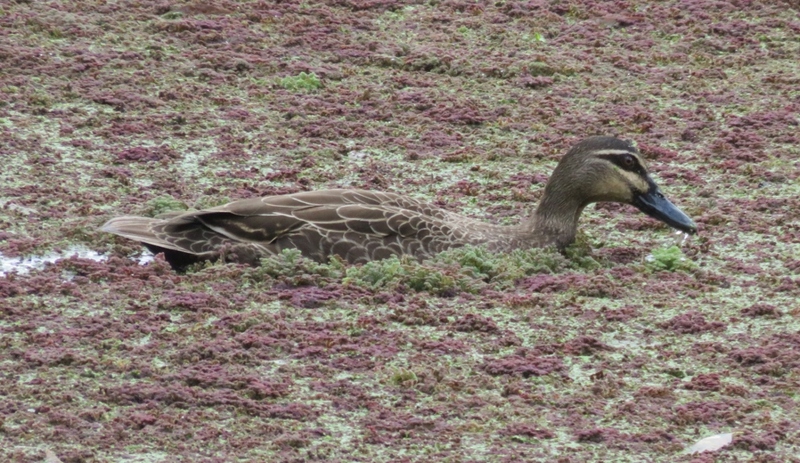 How very well camouflaged they are in their true environment. 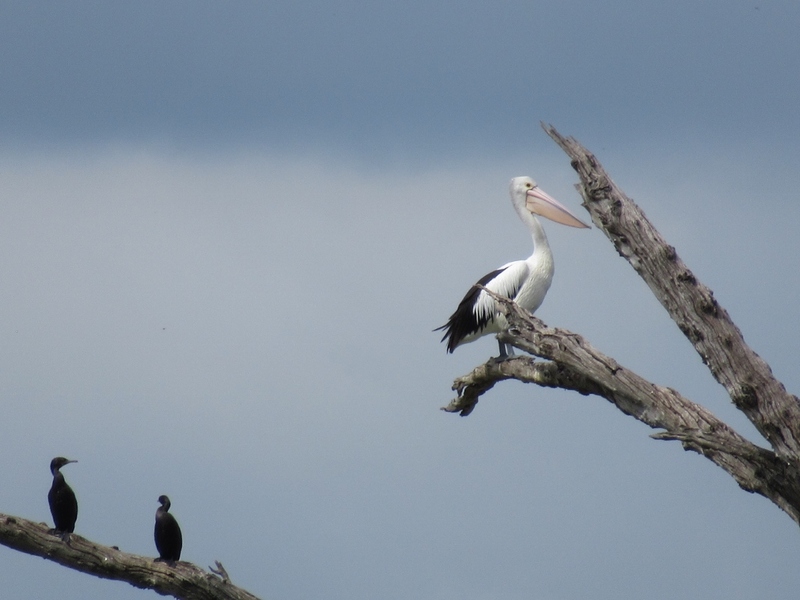 Fortunately Paul took this great photo (below) of the Pelican and two black Darters looking on. Paul’s second great shot was of this magnificent bird below, the Royal Spoonbill… close up you can see its eye, and the amazing white feathers flowing back from his head. 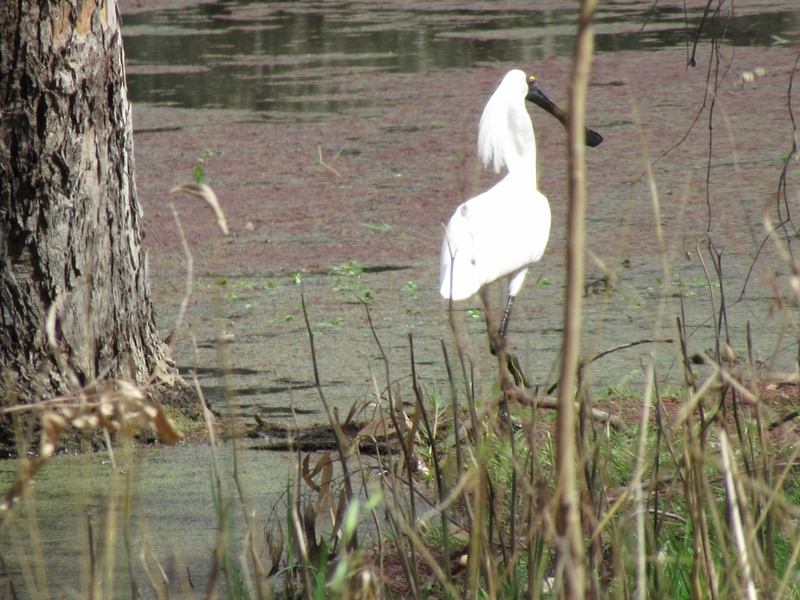 I’ve read that the male Spoonbill develops a lush crest of white feathers during mating season. We both spent a long time trying to photograph him as he put his amazing bill into the water, and skimmed along the edges of the lagoon, scooping up food to eat. ..but all our subsequent photos of this bird were blurry. 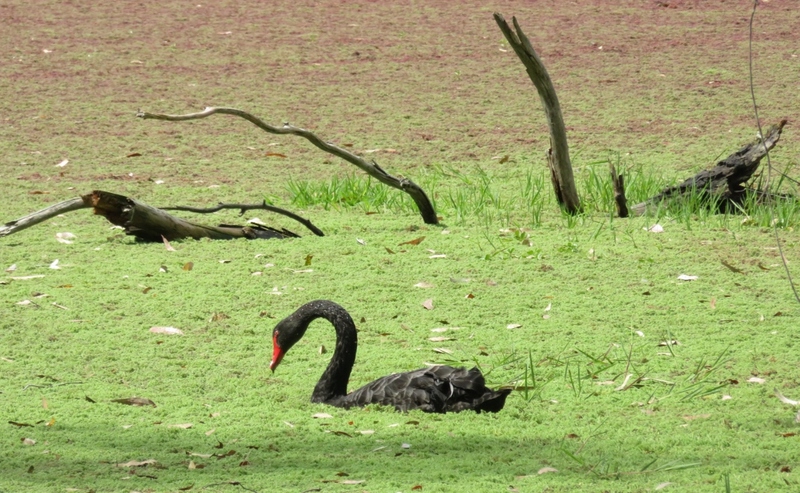 The ducks and swans seem to cruise happily through the thick algae. Near this pool of water…. There was very little sight or sound of these interestingly named frogs, but I did find some information from the website Backyard Buddies. 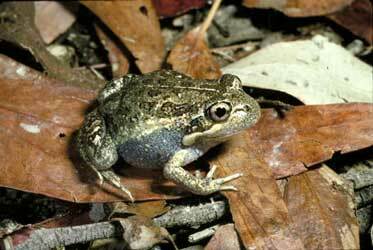 Pobblebonk Frog (or Banjo Frog) are found in Eastern Australia, in ponds and lakes. Like nature’s own bluegrass band once the Banjo Frogs get going you’d swear you were hearing musical instruments….rather than a small frog looking for a mate. When one frog starts to call, others will join in….a single bonk, or plonk sounds like a string of banjos being plucked. The Peron’s Tree (Maniacal Cackle) Frog is a tiny, and cute looking frog, but a very noisy creature. He sounds just like a jackhammer getting started when the mating season begins. Sometimes a Peron’s Tree frog gets into a drain pipe and calls, and there his call can reverberate and sound like the call of ten frogs, perhaps this is where the second name ”Maniacal Cackle” comes from ….. The Eastern, or Common froglet must feel very ordinary next to these two! Australia is the driest continent in the world, and we never take water for granted, so it is wonderful to see this wetland, full of water, wildlife and frogs! 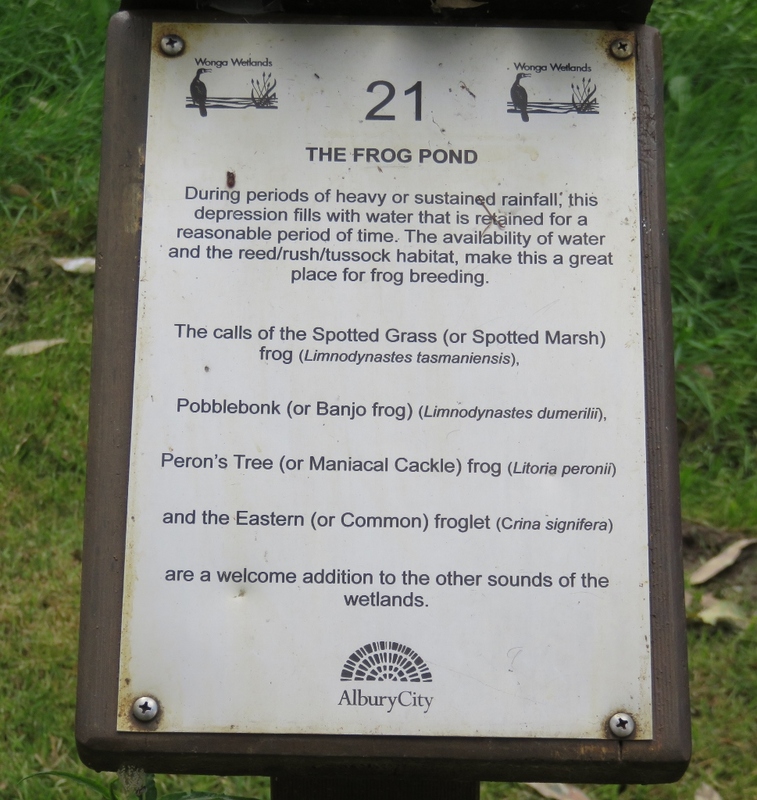 This entry was posted in Wetlands and tagged Albury, Banjo frog, black swans, Canberra, Cormorant, Darters, Eastern Comman frog, egret, lagoons, Maniacal frog, Melbourne, Murray River, pelican, Peron's Tree frog, Pobblebonk, Royal Spoonbill, Wiradjuri language, Wonga Wetlands on November 26, 2017 by germac4. What a fascinating place especially in such a dry country. I think you and your husband took some excellent pictures. Thanks Susan, the birds moved so fast, it was sheer luck if we got them! Loved the froggie stories. How aptly named. I love the green tree frogs at my place – they are always welcome, but I can’t say the same for the cane toads though. 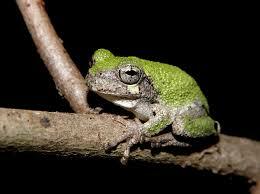 Yes, the green tree frogs are cute, apparently the Banjo frog is sometimes mistaken for the cane toad. What a wonderful post. Most of your bird posts are fascinating because your Australian birds are so exotic to me. But this one was fascinating because it highlighted how birds with long migration paths are so much alike world-over. We have similar cormorants, spoonbills, egrets, pelicans, and herons–halfway around the world. They are some of my favorite birds and such a treat to photograph. I agree these birds are wonderful, and their migration paths are just incredible….when you think of the weather conditions alone that they endure. I loved your description of the spoonbill, he does look as if he is dressed for a formal dinner! Thanks for the banjo frog call link, it sounds gentler that a group of banjos in reality, and cute! I miss our Porterville frogs, and the raucous toad. Here we are lucky to hear a few small croaks. We don’t get many frogs at home either, which is a pity. Gerrie, If you could choose anywhere in Australia to live, where would that place be? Good question! I love my small city, Canberra, where we have rolling hills outside the front door, but can also go to Writers Festival at the National Library 15 minutes away. So true! …and summer gardening. 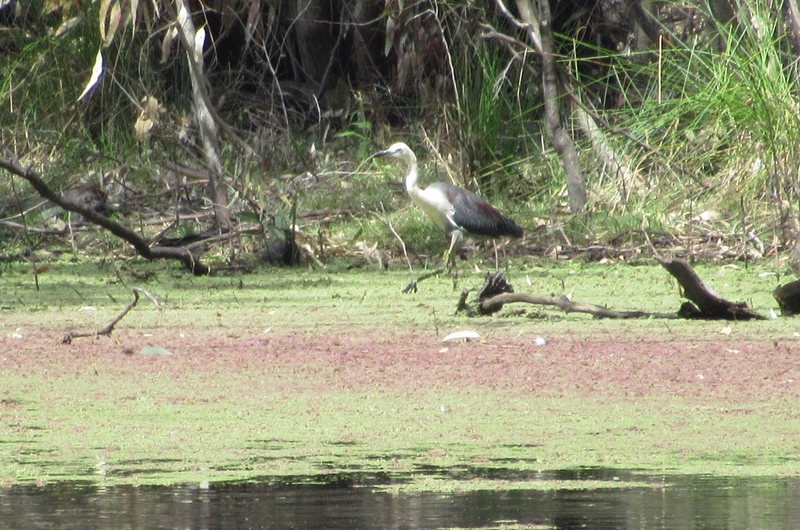 Australia really seems like a paradise for birders, and perhaps for froggers if there were such a thing. 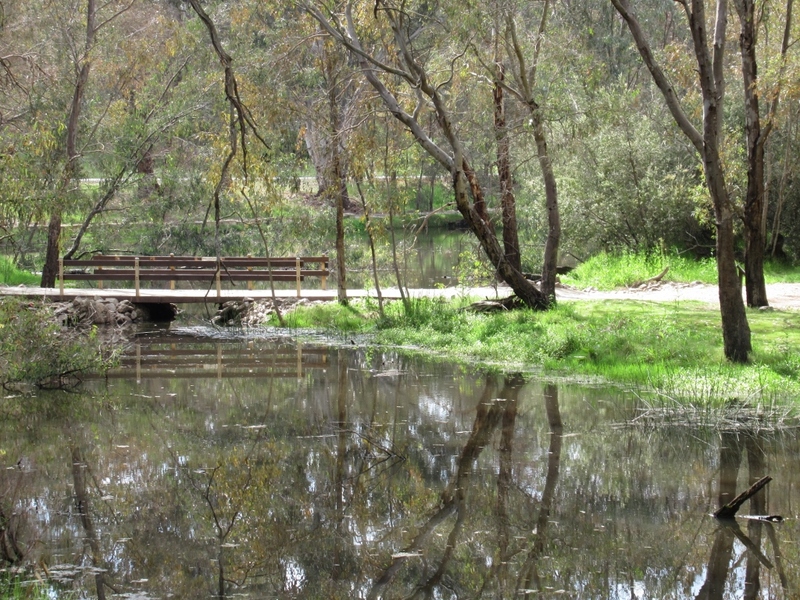 The Wonga Wetlands look like a very special place – and I like the name. Froggers….a great name, and I never realised how many froggers there were until I did this post. Yes the wetlands is also used for school groups which is wonderful. What an interesting place and such a diverse amount of wild life. you did well capturing them to show us. Thanks! We enjoyed that trip..